Learn how the Petzl TIBLOC can reduce the risks of simul-climbing. “The correct use of an ascender/progressive capture device, like the Petzl TIBLOC, on one of the intermediate protection points can protect the leader from receiving too hard of a pull if the second were to fall. Simul-climbing, correctly referred to as progression with a taut rope, is a style of climbing where both climbers move simultaneously while tied into the same rope. Protection is placed by the first climber while the second climber removes the gear. Progression with a taut rope is used on “easy” terrain and/or to save time, but placing reliable intermediate protection is still necessary. Partners climbing together with a taut rope is an especially dangerous technique and should only be performed by experts who have a good understanding of the risks and advantages that are associated with such a technique. They should be capable of evaluating the difficulties and objective risks of the terrain with respect to the technical abilities of the climbers involved. While climbing simultaneously, a fall by either climber will affect the other. In particular, a fall by the second will pull back on the leader, probably causing both to fall. 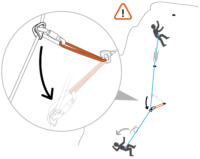 The use of an ascender/progressive capture device, like the Petzl TIBLOC, on one of the intermediate points can protect the leader from receiving too hard of a pull on his rope in case of a fall by the second. The fall will be held by the TIBLOC, without direct intervention by the leader. The usage of such a device should not be considered a belay. The TIBLOC only brings a plus to a dangerous situation when used correctly. The rope must pass through the TIBLOC’s carabiner so that it also serves as protection for the leader. The anchor chosen should be solid enough to hold the second’s fall, but also for the extreme case should both fall. The TIBLOC’s movement must not be obstructed by external elements like snow, rock, ice, slings, etc. could come out of its placement or the leader could get be pulled backward if the second falls. When using half or twin ropes, the TIBLOC can only be used on one strand to protect the second. The leader could still be pulled backward by the other strand. Beware of twists and tangles in the rope(s) that could interfere with the TIBLOC, cause pulling, or even block progression. Saves time on easy terrain where both climbers are confident in their abilities and skills. 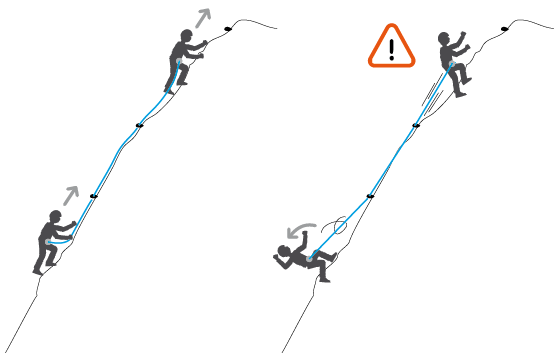 Can allow the next belay to be reached on a pitch that is longer than the rope: the second can begin climbing without endangering the leader on the last few moves to the belay. Can allow the easier, exit portion of a route to be protected, even when the second is still in a difficult part below. Risk of lifting slings or nuts. The second cannot descend and must progress upward in any case. 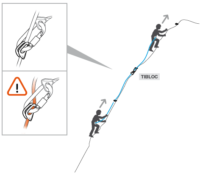 The leader can not be belayed in the event of a downclimb, making a loop of slack above the TIBLOC. Depending on the positioning of the device against the supporting surface, some rope may slide through the TIBLOC before jamming occurs, resulting in sheath damage. Can complicate progression when climbing on a half or twin rope system. Simul-climbing is an efficient, yet potentially dangerous technique for moving across easy terrain and/or saving time. 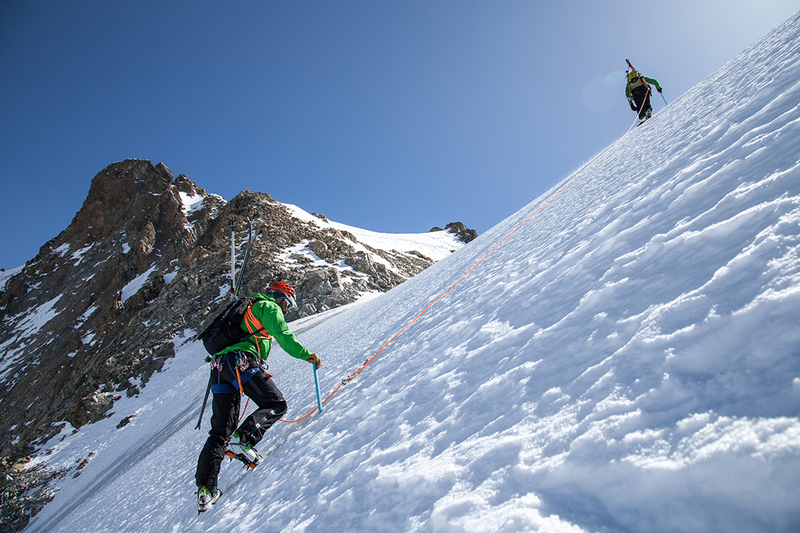 This mode of climbing and the use of a Tibloc to protect the leader should only be performed by expert climbers that understand the associated processes and risks.